The smartest way to find out how to cook ingredients that frequent hedgerows, is to consult someone of authority from a country where hedgerows thrive. Like England. 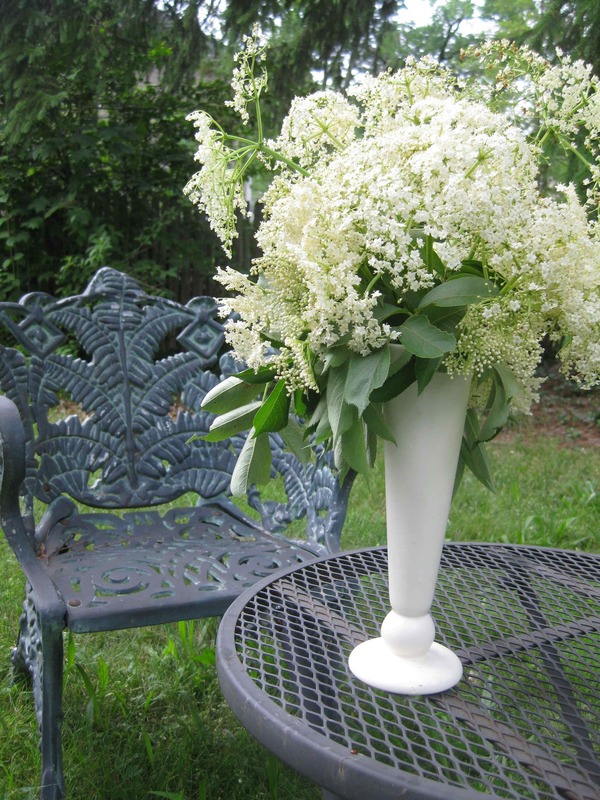 Elderflowers grow in the wild here in the U.S., mostly along canals and in boggy areas, but also along ditches that line country roads. 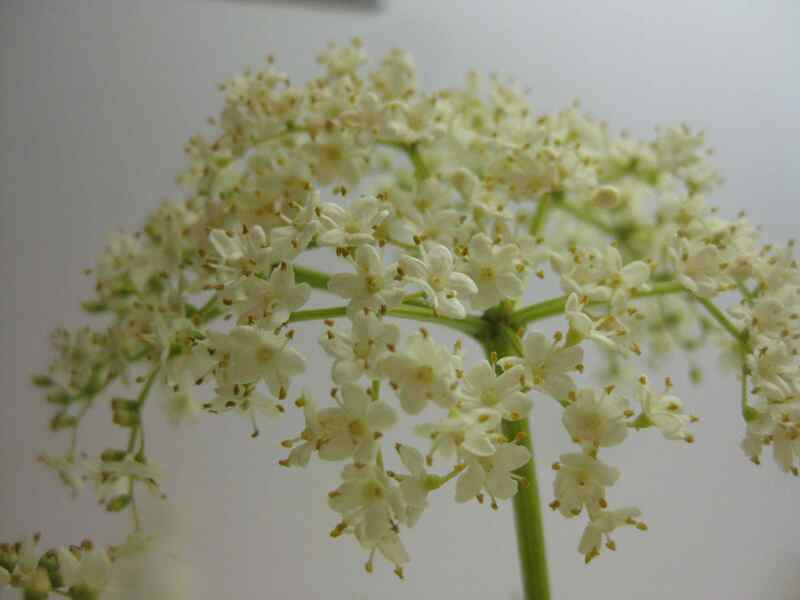 They bloomed this year just in time for the Queens’ Diamond Jubilee, so I couldn’t resist making Pam Corbin’s elderflower cordial from the Preserves Handbook in the River Cottage series. She claims that it comes from the River Cottage archives, and I have to say that’s it’s a wildly successful concoction that has clearly stood the test of time. However, I cut down on the sugar that she calls for, halving her basic recipe but quartering the sugar. 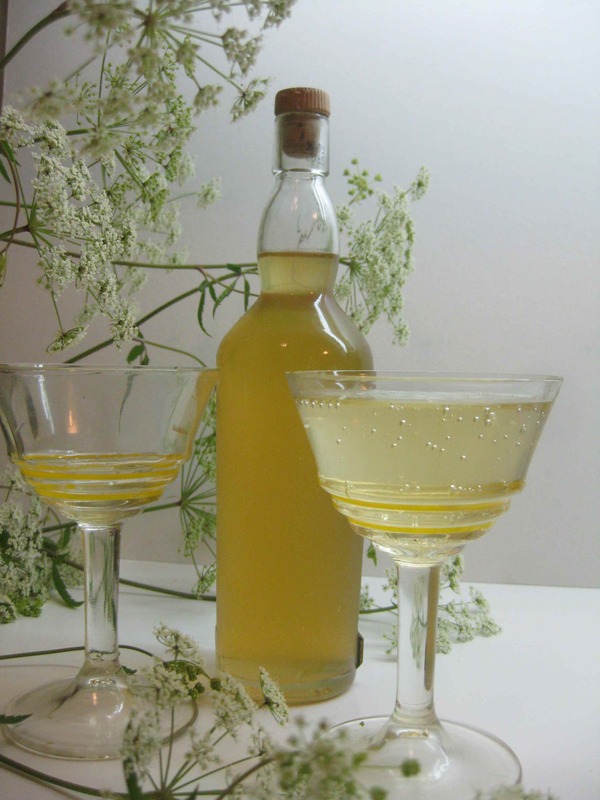 The elderflower cordial keeps for weeks in the refrigerator, months in the freezer and can be water-bath-canned if you add citric acid as a preservative. We enjoyed the elixir stirred into seltzer water, but I bet it would make a good aperitif with dry Proseco or Champagne. If you want something stiffer, add vodka to the combination of seltzer and elderflowers. This is the first time that I have made anything with elderflowers, somehow missing out on the season in previous years. It was a big risk on my part, however, as I braved snakes in the grass and got a fierce case of poison ivy, which kept me from making a return visit the following week. I would have liked to experiment with diminishing the amount of citrus in Corbin’s version, mainly because I wanted to get as close as possible to the essence of the sweetly scented flowers. As with all things with fleeting seasons, there’s always next year. I’m just glad to have had such success to date. It’s best to harvest the flowers before the day gets too hot, since the scent, and therefore the flavor will be most intense. Corbin mentions that it’s also best to pick them when some of the flowerets are still white buds on the verge of unfolding. Corbin throws the whole head into the pot, whereas others ship off the green stems, which I did for both color and taste. 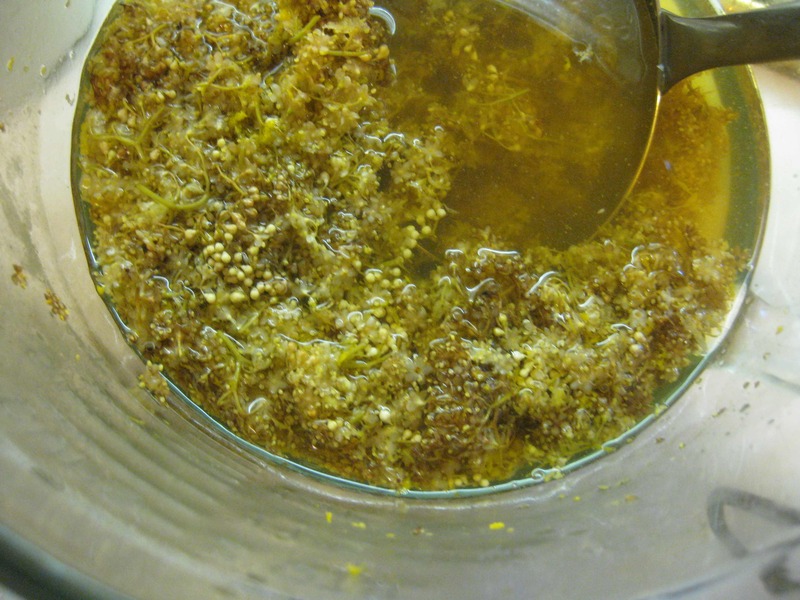 You basically infuse the flowers in boiling water left overnight, let the liquid drain out through a jelly bag, and create a simple syrup out of it a few hours later. As with any foraging, you should not devastate an entire plant. The flowers quickly turn to berries, which are also useful foods, and you want to make sure that the bushes propagate. Cut the elderflowers from the heads, removing most of the green stems. This should yield about 2 cups. Shake the flowerets in a colander or sieve to remove loose dust and lightly wash. Place the flowerets and citrus zest in a large heatproof bowl and pour the boiling water over them. After it’s cool, cover and leave overnight to infuse the water. Strain the liquid through a jelly bag for a couple of hours. Do not press down on the flowers to avoid getting a murky liquid. Place the liquid in a saucepan, add the citrus juice, sugar, and the citric acid, if using. Bring to a simmer and cook for a couple of minutes. Pour the hot syrup into sterilized bottles or jars and seal. Store in the refrigerator or freeze it. (I found that I wanted to strain it through a coffee filter after it was cool to clarify the liquid.) This can also be canned using a water bath method, but you might want to double the amount of sugar I used and include the citric acid.